So here are my thoughts on what the concert sounded like via MPR last night. The concert began with Polina Nazaykinskaya’s Winter Bells. 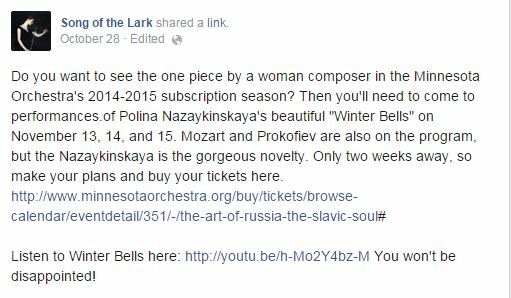 Nazaykinskaya is the only woman composer in the Minnesota Orchestra’s sizable 2014-2015 subscription season, and also my Facebook followers are tired of hearing me complain about this. Ah well. If women could only make one contribution to programming this year, Winter Bells was definitely a fabulous choice. How often does a work by a 22-year-old hold up against Prokofiev and Mozart? The orchestra’s treatment of the gorgeous score felt hugely confident; the lower brass blasted away with spectacular abandon. And the way the sound evaporated away at the end? Pure magic. Soloist Jonathan Biss was a polite presence at the piano in Mozart 20. Perfectly lovely and unobjectionable. Which isn’t to say the performance wasn’t enjoyable. But it wasn’t gripping. It felt a bit like filler. And I wonder if I’m the only one idly curious how Mozart ended up in an Art of Russia program. Orchestra advertising justified it by saying that Mozart was “a Russian at heart.” O-kay. That being said, I’m not sure how well live Mozart transfers over Internet radio, so your mileage may vary if you saw it live. And the audience reaction sounded wild, so this one might be on me. Prokofiev 5 was the meat of the program. Gleaming propulsive meat, with an earnestly, sometimes nostalgically, beating heart…and a dash of insanity. The intensity of the last few notes of the first movement was simply shattering. Said intensity carried over into the maniacally metronomic second movement. I love this music; it sounds like sarcastic skeletons dancing. (Somehow.) The spitting runs in the strings and winds were genuinely creepy, both because of the sound produced and because I didn’t know it was humanly possible. The third movement was balletic: graceful, luscious, very Russian. But still slightly odd, as if the skeletons had put on tutus. (Somehow.) These sounds are strange, maybe even slightly dangerous, but they’re so seductive, and in the hands of these players Friday night, so committed and so heartfelt. The finale began with a quiet wild-eyed mania, seizing one idea after another, before going completely batshit crazy with agitated caffeinated palpitations. Perfection. Definitely my favorite radio broadcast so far this season. I know I say it every week, but this week I really mean it. Buy tickets for tonight at minnesotaorchestra.org. Seriously. I’m incredibly depressed I won’t see it live. Can’t guarantee a Microreview for next week, as I’m aiming to catch Tchaikovsky 5 in-person! So keep an eye out for an entry on that, as well as some others that are cooking on the back burner. The thing that strikes me: by all rights, we should be despondent. And yet – I don’t think I’ve ever been to a more joyful concert. The Minnesota Orchestra should be playing in its newly renovated hall in downtown Minneapolis. And yet – thanks to a fifteen-month-long musician lockout, they aren’t. Ted Mann Concert Hall on the University of Minnesota campus has been rented for musician-produced concerts instead, and it works just fine. Stanislaw Skrowaczewski, the former music director of the Minnesota Orchestra, is ninety. Most men his age are crippled or dead. He shouldn’t be physically able to lead magisterial performances of Brahms and Wagner. And yet – here he is tonight, graciously accepting our wild applause, magically drawing forth music, gladly flouting his former employer in the classiest possible way. The musicians should be performing on a newly renovated stage, fresh from triumph at Carnegie Hall. And yet – their Carnegie concerts are canceled and their music director is gone. Instead, they’re learning the fine art of PR, renting halls, serving on fundraising committees, debating repertoire, coordinating educational activities, and selling out concerts. My volunteer audience activist friends should be occasional concertgoers and amateur musicians who go to concerts, enjoy them, and then go home to their families. And yet – now they’re devoting endless hours to poring over various orchestras’ financial records, while befriending influential politicians and studying the principles of non-profit management. I should be curled up at home, a woman in her mid-twenties happy in her anonymity, writing essays about Victorian violinists that nobody reads. And yet – thanks to the lockout, I recently went on a WQXR podcast talking about the impact of social media on the arts with the former head of social media with the Dean campaign. The last fifteen months have been one long story of “x should be, but y is.” Unintended consequences abound. People have tried to control them, but those who try, inevitably fail. “It would be easy to be bitter, but I am thankful,” horn player Ellen Dinwiddie Smith tells us before the Brahms symphony. She is thankful for the audience, she says. For her colleagues. But most importantly, she is thankful for music. We’ll soon announce a star-studded self-produced season to begin in the New Year, Ellen then says, very coyly, and the audience murmurs with excitement. Once upon a time, Minneapolis had an orchestra, and it was recognized as one of the greatest in the world. On the strength of its artistry, $100 million were raised to support it in the depths of the Great Recession. Half of that money went to support new artistic initiatives and the endowment, now the fourth largest in America…larger than New York’s and Los Angeles’s. The rest went to a huge new lobby of glass and stone, currently nearing completion on the south end of Nicollet Mall. It will be finished by early July. But there will be no orchestra to open Orchestra Hall. Last October, three men – two banking executives on the Minnesota Orchestral Association board of directors and one spectacularly inept orchestra manager from Bournemouth – slipped the Minnesota Orchestra a potent sleeping potion in the form of a lockout. The MOA has not presented an orchestral concert since late July, and they will not be presenting any this July, either. Even after seven months of not paying musicians’ salaries or benefits, they claim they don’t have the money to present concerts…and it’s simply too expensive to play and talk, CEO Michael Henson explains. Mr. Henson continues to receive around $400,000 a year in compensation, the orchestra manager who doesn’t actually manage an orchestra. He makes a perplexing bedraggled picture, pleading poverty while wearing a yellow vest and hard hat and showing off his fifty million dollar lobby. The state of Minnesota is currently investigating the MOA’s finances. 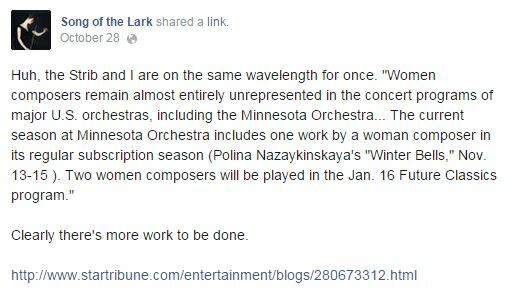 Things in Minneapolis have gotten so bad that a quarter of the orchestra’s seats are empty, with more musicians departing every month. There is no end in sight. Every eight weeks or so, the musicians of the Minnesota Orchestra cook up a short-lived antidote to the potion: they put on a concert of their own. With the help of two of their former music directors, as well as their current conductor, Osmo Vänskä, this season the musicians have put on extraordinary performances of Dvořák, Shostakovich, Bach, Beethoven, and Sibelius. A few weeks ago they announced a late April concert: a program of Mozart and Bruckner, to be conducted by their former music director, eighty-nine-year-old Stanislaw Skrowaczewski. The soloist in the Mozart clarinet concerto would be principal Burt Hara, one of the great orchestral musicians in the world. As always, the tickets sold fast. 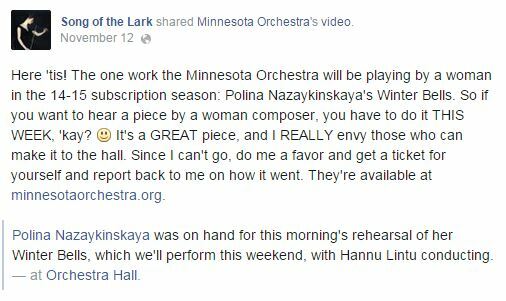 A Minnesota Orchestra lockout concert is different from any other orchestra concert you’ve ever been to. They will be sold out, so they will be crowded. The audience will skew young. Everyone present will be an intense, intelligent lover of music. You will find yourself waving across the hall at people you’ve only met once before; they will eagerly wave back to you. You will feel like you’re at a family reunion that has a concert built into it, because the musicians have gotten to know patrons, and the patrons have gotten to know musicians, and the invisible wall at the edge of the stage has crumbled. Turns out we’re no longer just fighting for our musicians; now we’re fighting for our friends, too. You will hear the kind of roaring applause and hoarse screams usually reserved for the debuts of prodigies. You will meet and chat and sit with politicians, multi-millionaires, and occasionally local celebrities, all of whom are disgusted with the action of the board. These concerts will be, simultaneously, the most emotionally taxing and the most emotionally fulfilling experiences you will have as a listener. They will reaffirm your belief about the power and relevancy of orchestral music. And they will give you the strength and inspiration to fight for excellence in all aspects of your life. You will also cry into your pillow once you get home, overcome by the enormity of what you have just experienced. Of course lockout concerts would mean nothing without a passionately engaged audience, and I’m proud to say that the Minnesota Orchestra has the most devoted audience in America…maybe in the world. Behind the first violins stood a eight-foot-tall tower of flowers. I’ve never seen a more beautiful arrangement. Their color and fragrance were all the more beautiful after our long – both literal and metaphorical – winter. They’d been sent with love by a translator from Japan, who has loved the musicians of the Minnesota Orchestra for many years, but who could never bring herself to write to tell them so until the lockout began. Their recordings helped her pull through terrifying health scares and the devastating earthquake of two years ago. Eriko couldn’t be in Minnesota in person, but her pillar of flowers stood like an angel sentry on the corner of the stage. At the time of the concert, she was across the world in Japan, meditating. The musicians received two or three standing ovations before a single note sounded. Skrowaczewski came onstage, eyes sparkling. The Minnesota Orchestral Association will never invite him to conduct again, thanks to his unabashedly heretical pro-musician views, but it is clear he is enjoying playing the role of the rogue. Then out came Burt Hara, our magician of a clarinetist. He has worked at other orchestras over the years, but, thankfully, has always returned to Minnesota. He is the living personification of why we patrons are working so hard to pressure the board to back down from its proposals: Hara could easily get a job anywhere in the world, and whoever would win his seat here would simply never be able to fill his shoes. End of story. Michael Henson has gone on record saying every musician in the orchestra is easily replaceable. Michael Henson has no expletive-ing clue what he’s talking about. 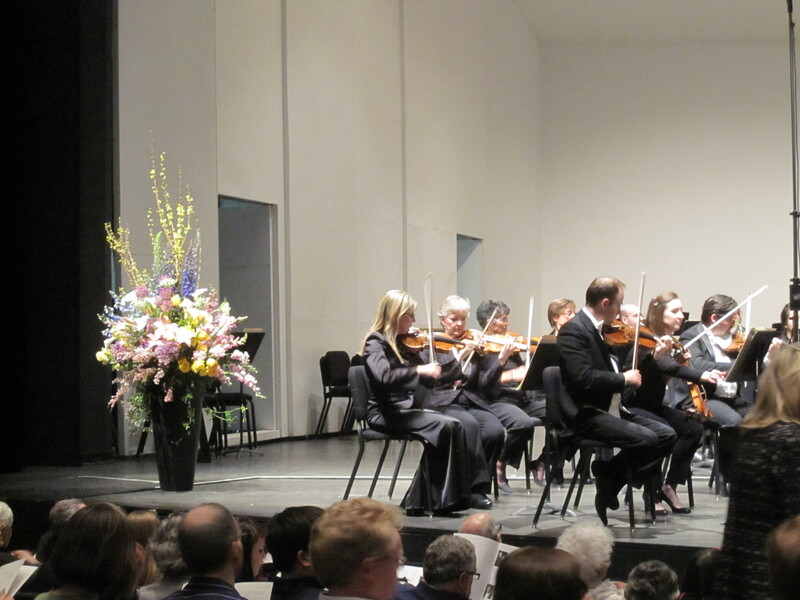 Every phrase of orchestra and clarinetist was a new delight, blossoming like the flowers in Eriko’s arrangement. The variety of tones that Mr. Hara has at his command is nothing short of miraculous. Anyone who can’t tell the difference between a player the caliber of Burt Hara and his theoretical replacement not only has no business running an orchestra, but is ultimately destined for sad and pathetic failure in the field of orchestral management. In case this remark was too subtle for anyone, it’s directed squarely at Jon Campbell, the Wells Fargo vice president who is chair of the Minnesota Orchestra board of directors. Despite being one of the most powerful people on the Minnesota Orchestra board, Jon Campbell never actually goes to Minnesota Orchestra concerts. If you can’t appreciate Burt Hara – and there’s no way you can, if you never go to concerts – then have the simple human decency to step aside and hand your job over to someone who does. I was still basking in the glow of the Mozart when, after intermission, as the lights were dimming, Mr. Hara came out into the hall. The audience began to applaud him. He grinned and shushed us. “Shh!! Not for me; for them!” he said, motioning toward the stage, and at that, my heart overflowed with admiration. He sat down in the empty seat next to me and smiled. Joyful, invincible energy radiated from his very pores. After intermission, as has become tradition, violist Sam Bergman stepped up to the edge of the stage. By now the whole locked out audience knows what that means: a barnburner of a speech is at hand. And although all of Sam’s speeches have been extraordinary, this one was especially so…and the audience’s impassioned reactions said as much as Mr. Bergman. Cries: actual moans of shock and pain. It was as if someone had stabbed all two thousand audience members at once. Another indignant communal cry. People actually began to weep in horror. I closed my eyes, tight. I knew this was the board’s plan, and I’ve known it for a long time, but to hear so many music lovers react to it so viscerally was nightmarish. In this context, Bruckner suddenly meant something. (In this context, anything means something.) As fate would have it, almost a year ago to the day, I’d written a rather…controversial blog entry called “I Hate Bruckner, Part I.” Clearly Fate has a sense of irony that puts Stephen Colbert to shame. You say you hate Bruckner?, Fate says. Well, then, how about for your first live Bruckner experience, I snag you a legendary Bruckner conductor, sprinkle dozens of friends onstage and in the audience, and top it all off with the orchestra The New Yorker has labeled the greatest in the world. That’ll be a good introduction to Bruckner. Oh, and also, by the way, said orchestra is facing imminent dismemberment, if not outright dissolution. So enjoy! It was a lot to swallow. But lucky for me, I wasn’t setting out on my first live Bruckner journey alone. I just happened to have beside me one of the world’s great orchestral musicians, who knew the piece inside and out, and who would teach me how to approach it. He swayed gently to the sounds, nodded before each woodwind entry, breathed in and out with every phrase. Through his body language, he showed me what to listen for. Big swaths of sound that had once been a meaningless brick wall took on a shape and direction: a narrative. He wasn’t doing this to teach me. He was moving with the music because he could no more stop the flow of music through him than I could stop breathing. I was just lucky enough to sit beside him to witness it. At the first solemn horn call of Bruckner 4, my horizons began to broaden, and the appeal of the music slowly dawned. Time and space simply – disappeared. At every repetition of every phrase, the musicians clawed at every note as if their very careers depended on it…and maybe they did. The seats rumbled with each massive fanfare. The graceful old man gestured on the podium, drawing out the magnificent sound from his mind’s ear. The massive tower of flowers stood guard. As time drifted on I was unsure if we had been in the hall an hour…or twenty-four hours…or twenty-four years. We fell into a collective trance. How long had the lockout gone on? Was there even a lockout? Surely not… All two thousand of us were swept away in the music and looking out over a cliff together – out at an ocean, perhaps. Or maybe we were on the top of a mountain, landscape spread far to the horizon. But as Sam had said, we were together…and surely, to be all together in our dark night in that dark hall…surely that means something? For as long as this lasts, we won’t be alone. Giant chords shifted beneath our feet and resolved in strange and glorious ways. A strange irrational peace descended upon me, the kind that comes when I recite well-worn phrases from my wrinkled Book of Common Prayer. Stan raised his arms, a prophet in the bright stage lights. Suddenly the past and future meant nothing; there was only the power of the present. This is transcendence. The integrity of Stan – the generosity of Eriko – the eloquence of Sam – the passion of Burt – the courage of the Minnesota Orchestra musicians to sacrifice their very livelihoods in an attempt to preserve their beloved institution from decimation – the buzzing energy of the agitated Minneapolis music scene – and most of all, the untrammeled power of live orchestral music. You would be unwise to bet against.any of these things, let alone all of them at once. They may be under fierce assault, but I swear to God that Minnesota will not rest until all those things are celebrated as they deserve to be. Silence may win in the short term. But in the end, you will not deny the power of this music, nor the power and professionalism of these musicians. Our story is not over yet. This city will keep fighting until the very bitter end to find our musical happily ever after…no matter how many barriers the management of the Minnesota Orchestra sees fit to put in our way in the meantime. There was a long silence after the earth-shattering final chords were struck. We all could read one another’s mind: this moment is too sacred to end. Then, gingerly, we began to applaud, gradually getting louder and louder, until the hall was a roiling sea of applause. The orchestra received such a long ovation that, in order to make it stop, the musicians had to leave the stage.